Inferior Vena Cava may appear congested when it’s dilated without any respiratory variation collapsed with very small diameter through the respiratory cycle, or compliant and vary through respiratory cycle. 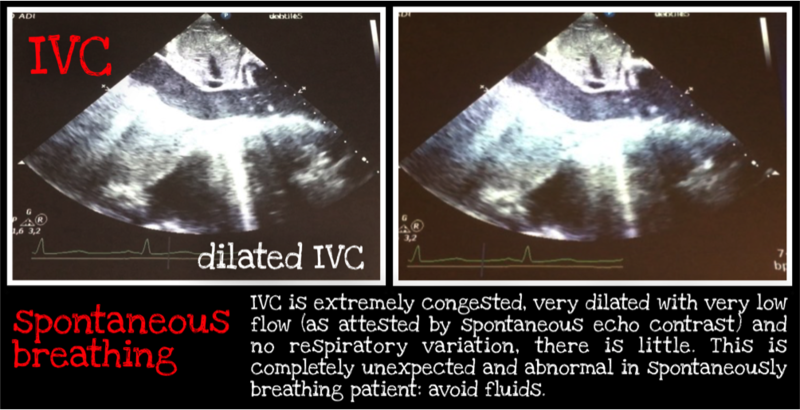 But how IVC looks like depends on how the patientis breathing, spontaneouslyvs mechanically ventilated. During spontaneous breathing, in inspiration there is a decrease in pleural pressure, partially transmitted to the heart chambers with a decrease in Right Atrial Pressureand increase in Venous Return (the lower the RAPthe easier the venous return). Because of this decrease in RAP there is a decrease in IVC transmural pressure the size (diameter) and a decrease in size of IVC. To give numbers, a 40% variation in spontaneouslybreathingpatients is usually associated to preload responsiveness: patient will respond to fluids (but it does not mean that he needs fluids: gives only if associated hypotension/poor perfusion). 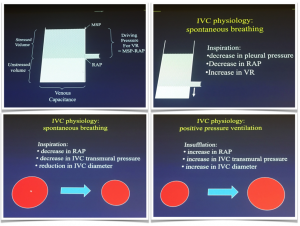 In patients with positive pressure ventilation physiology is completely reversed: you put positive pressure in the thorax, this is partially transmitted to the heart chambers whit an increase in RAP, an increase in IVC transmural pressure and in IVC diameter. We expect a dilated and non compliant Vena Cava due to the impeded venous return, collapsible vena cava is an abnormal finding. If you observe a compliant Vena Cava n a patient on MV, changing diameter with ventilation, actually increasing diameter with insufflation due to raised pressure in thorax impeding venous return and flattening in expiration with pressure release), this means that probablythis patient has volume in the veins that can be recruited. A > 12-18% variation in mechanically ventilated patientis usually associated to preload responsiveness(Feissel et al. 2004 http://bit.ly/2Cvm6Fp; Barbier et al. 2004 http://bit.ly/2Pb8R3p). In patients with elevated Intra-Abdominal Pressure IVC is not interpretable anymore. The endpoint of resuscitation is improve tissue perfusion, not to increase IVC diameter. 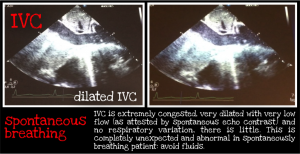 The respiratory variations in large vessels just attest that there is some stressed volume that can be recruited: is vein collapses there is room to expand a little more and by increasing the stressed volume there is an high probability to increase the venous return and cardiac output if you think this in needed.And remember: IVC measurement really simple but not make the vena cava say what it can’t say. It was delightful listening to Paul Mayo deliver this excellent talk based on his clinical experience. Critical care echocardiography is a different beast to the traditional “echo lab” approach favoured by cardiology. Our environment does not lend itself well to hour long studies per patient recording every measurement. His unit adopts a flexible approach, deploying aspects of advanced echo as needed to answer specific clinical questions. Occasionally a full study will be performed. For quality control reasons, all their TOEs (TEEs) are full studies. NYC is staffed by 10 attending and 6 “night owls”, all of whom are competent in general critical care ultrasound. 3 of the team are competent in advanced echo. Images are saved, and relevant findings documented in notes (except TOEs which all get a ful, report). Interesting cases are discussed at a weekly meeting. For those training in advanced CCE, Mayo recommends ALL views and ALL measurements are performed in a specific sequence, and images rejected if they are suboptimal. Not only does it upskill the user, it brings credibility to the field and reassures our cardiology and imaging colleagues. These were certainly useful points that all of us in the critical care and imaging community should take note of. Occasionally you might see clot in transit! If your RV is failing, Prof Vieillard-Baron recommends noradrenaline as it’s “magic for the RV”! Prof Anthony McLean from the Nepeam in Sydney delivered this excellent masterclass using a case from his unit as an example. And indirectly using the tricuspid regurgitation jet and IVC size/collapsibility. RV assessment is complex. Both subjective and objective parameters are necessary to quantify its function. Be careful with patients on inotropes as they confound things. Prof McLean’s daily “go-tos” are TAPSE, TR/PASP. If still unsure, he adds FAC and TDI (S’).